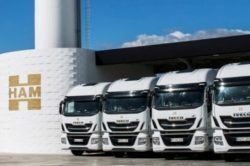 Transportes HAM, a company of HAM Group, last week added to its fleet 25 new IVECO Stralis NP powered by natural gas — the first heavy vehicle designed for long distances capable of achieving the same power as its diesel equivalent. The trucks are powered by an 8.7 liter Euro VI IVECO Cursor 9 natural gas engine that develops 400 hp and a maximum torque of 1,700 Nm. The new Stralis NP is also the first natural gas truck with 12-speed automatic transmission, thanks to the Eurotronic transmission, which guarantees a lower fuel consumption and greater comfort in driving. Larger capacity fuel tanks increase the autonomy with the only LNG version, which reaches a record distance of 1,500 km. In an event that took place at the HAM facilities in Abrera (Barcelona) last week, José María Chamizo, Director of Gas Development at IVECO, delivered the vehicles to Antonio Murugó, CEO of the HAM Group. This acquisition confirms the commitment of the transport company to the development of engines that use alternative energy to diesel. 90% of HAM Transportes vehicles use liquefied natural gas (LNG).